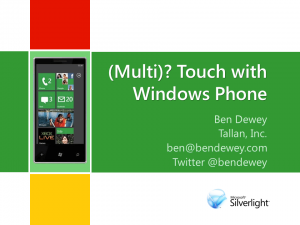 I recently had the opportunity of presenting my MultiTouch on the Windows Phone 7 presentation to a great group at the Fairfield/WestChester User Group. Thank you to everyone for coming out and enjoying the evening with us. My slides and Windows Phone demo application are available for download using the links below.